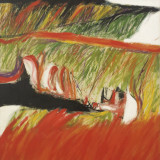 First published to accompany major retrospective exhibitions at West Cork Arts Centre, the Irish Museum of Modern Art (IMMA), and Piano Nobile, Kings Place, this full-colour illustrated monograph explores William Crozier’s whole career, taking in the second half of the twentieth century – a key period in the development of British and Irish art. The catalogue is furnished with essays presenting brand new research by renown art historians and curators, Illuminated by unpublished sources and personal memoirs. What emerges is a picture of the continuum that runs through all of Crozier’s work, revealing a fascinating narrative that, far from a story of transformation from darker, earlier imagery into the apparent hedonism of later landscapes, is one of continuity of purpose in Crozier’s mind-set that connects 1950s Britain and Ireland with the concerns of the new millennium.